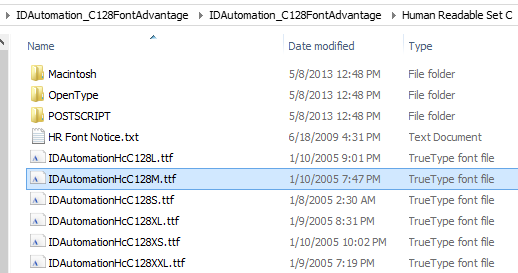 The font name IDAutomationSHcC128M is the sample/demo version of the Code 128 C human readable font. The S stands for sample/demo, the H stands for human readable, the lowercase c stands for character set C, the C128 stands for Code 128, and the M is for Medium barcode height. The equivalent of this font is IDAutomationHcC128M (sale version does not include the letter S after the name IDAutomation).